The decorative and natural stone was earlier a sign of luxury and prosperity. Just a couple of decades ago, it was problematic and difficult to include a fireplace in the interior of the house, and especially the apartment. Now, manufacturers produce a huge range of electric fireplaces, for which it is enough to mount a plasterboard niche in the form of a fireplace and decorate it. 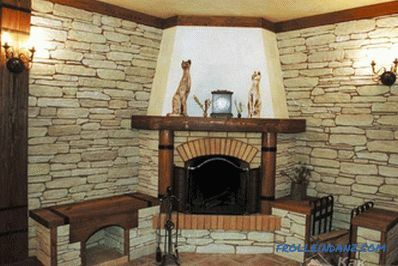 For example, a fireplace decorative stone will suit. Environmentally friendly. When it comes to quality material, it is safe to say that it is made on the basis of exclusively natural components. That is why, even with high surface heating, no toxic substances and vapors will be released from this material that can harm human health. Non-combustibility. 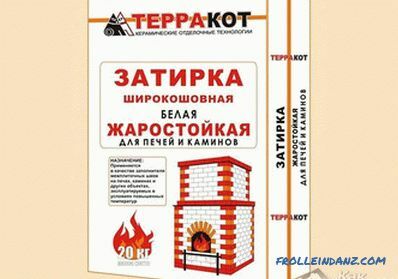 The artificial stone is a non-combustible product, which allows to bring it as close as possible to the open hearth. Durability and heat resistance. 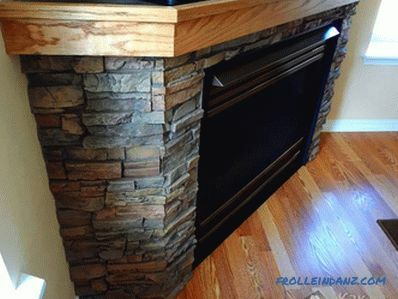 Even if the fireplace will constantly function, the material will not lose its properties. Ease of processing. 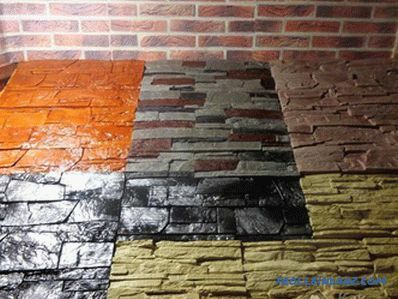 To cope with the decoration of decorative stone, everyone can do it yourself, just read the recommendations and instructions. Versatility. You can give the material absolutely any shape. Weight. 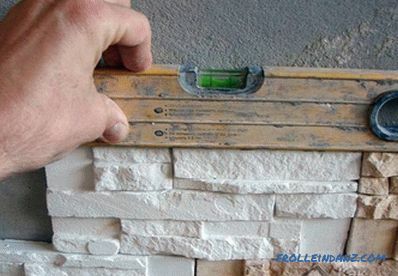 Artificial stone trim will weigh significantly lower than natural stone. Assortment. In the building stores you can see a large variety of colors, shapes and textures. Cost. Unlike natural stone, it will be several times cheaper. The manufacturing process is primitive and simple: the mixture of components is poured in a special relief form and sent to settle. The cement-based stone is resistant to moisture, so you can put it in the kitchen, but the gypsum base for this purpose will not work. Before In total, you should get acquainted with the most common types of decorative stone, suitable for facing the fireplace. Porcelain tile is similar to natural stone due to its properties and appearance. Majolica is a ceramic tile, which is poured with glaze. Terracotta is similar to majolica, but does not have a glazed coating. The clinker is made on the basis of clay, into which various additives interfere. 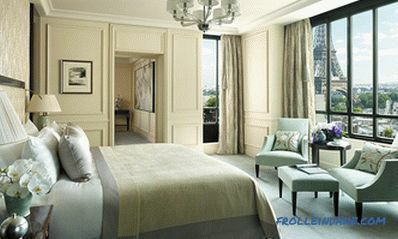 Each of them can harmoniously fit into the created interior and style of the room . But, since we are talking about finishing the fireplace, it is necessary to approach the choice of material responsibly, so that the result of the work will meet all expectations. To do this, enough to take into account a few tips from the experts. It is important to carefully consider the design of the fireplace, since its shape, size and color of decoration should fit into the interior of the room. Carefully read the technical specifications that should be listed in the accompanying documentation. All purchased items must have identical size, weight, color and texture. 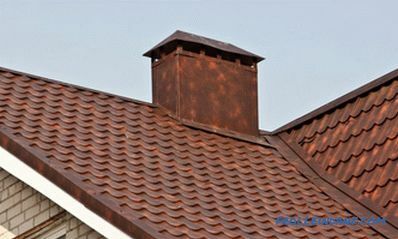 The surface should not have any defects: dents, spots, cracks and scuffs. Domestic products will be cheaper than imported ones. Check quality certificates and documentation from laboratories after testing. Pay attention to the date of their manufacture. Facing material should not go on sale before the expiration of 28 days, since it is during this period that the stone gains strength. All facing materials are transported in special packages. They should be marked with the logo of the manufacturer. Facing natural stone - it is quite time-consuming and expensive process, which will require the availability of special knowledge and skills. Those who decide to save, choose an artificial stone. 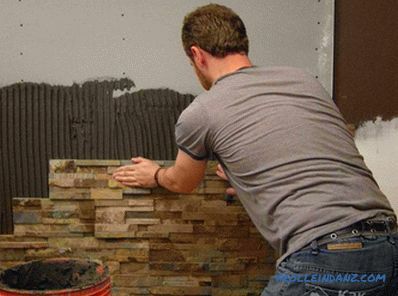 Experienced builders compare this process with the laying of conventional ceramic tiles, which does not cause any particular difficulties and problems. The process is divided into several stages. 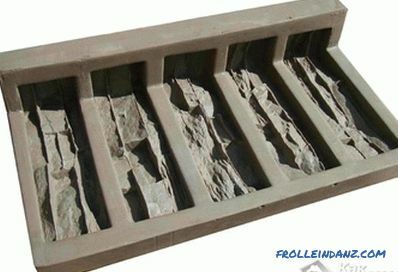 The decoration with artificial stone does not provide any special preparatory work. So, the surface will be enough to clean the dust and debris. 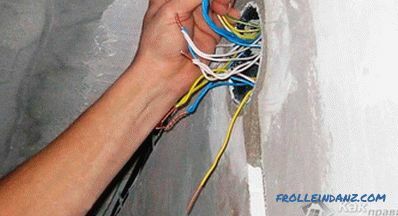 If the lining is made directly on the reinforcing mesh, then you will need to first fix the mesh with nails, and then level it with glue mortar. 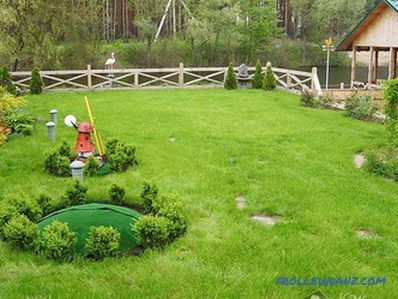 You can proceed to the next step only after the leveling and prepared surface has been completely dried. There is also a simple algorithm of actions here. For convenience and accuracy of work at the top of the fireplace, two nails are hammered and tied with string with weights at the end. This will allow for vertical stacking. Laying the stone starts from the bottom. 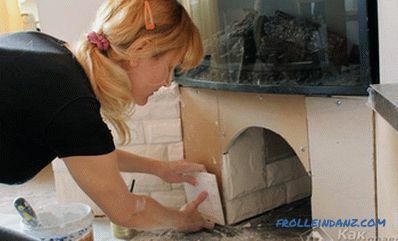 To this end, an adhesive solution is applied to the surface of the fireplace with a serrated spatula in an even layer. No need to immediately use a large area. The decorative stone is tightly pressed to the surface and the masonry flatness is adjusted in accordance with the plumb lines. With the help of a rubber mallet slightly tapped. Plastic crosses are fixed between the tiles to align the seams - there are two pieces on each side. Evenness must be observed on the plane, for which use the building level or flat rail. If an incorrectly fixed element is found, it should be immediately re-glued until the glue hardens. Similar actions are repeated for all rows until the very end. After completion of the work, a minimum of 24 hours should pass, after which you can proceed to grouting and removing crosses. In the store you can find a fairly rich assortment of mineral grout. The grout should be applied with a rubber trowel, and leveled with a damp sponge without strong pressure. 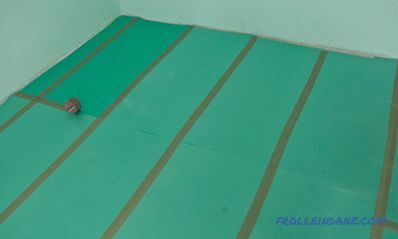 Remove residues from the tile can be 20 minutes after application, using a dry cloth. You can put the fireplace into operation in another day. The instructions described a suture method of laying, but to save glue, you can choose and seamless - the stones should fit tightly to each other. In the process of laying decorative stone, it is necessary to immediately remove residues and traces of glue from the surface. 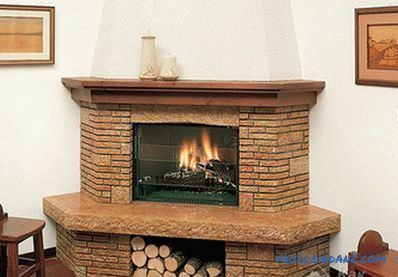 For a fireplace, it is recommended to choose only a heat-resistant stone. The same principle must be followed when choosing glue. Too large stones glue mortar can not stand. 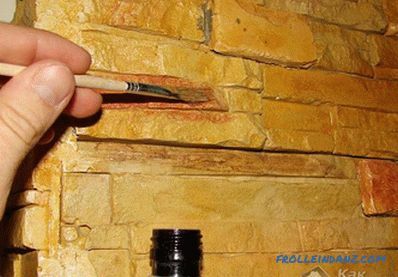 Facing with a decorative stone is carried out only from the side, and the upper part should be flat so that it can be, for example, put photos and scented candles. A fireplace lined with decorative stone will look great in combination with a variety of surfaces: wood, rough, smooth and glass. Using artificial material, you can decorate the fireplace in various styles. If you want to achieve the effect of antiquity, you should choose a stone with a coarse-grained structure. Unusual relief and irregular shapes will help to embody any idea and design decisions. In this element both refinement and elegance will be combined.